There have been calls to introduce tasers for rank-and-file officers. Gardaí at the scene of the shooting of Jason 'Buda' Molyneux in Dublin's north inner city. UNARMED GARDAÍ INVOLVED in conducting posts outside the homes of at-risk members of the Hutch family are having their safety details reviewed after members voiced their concerns to management, TheJournal.ie has learned. Uniformed members of An Garda Síochána were placed outside some high-risk gangland targets this week due increased fears of a threat to the North Dublin based family. The gardaí belong to the Dublin North Central district. However, the officers were only armed with their batons. There have been calls for rank-and-file members to be issued with Taser guns. Armed patrols put in place in response to the recent ratcheting up of gangland violence remain in place across the city, and can respond to incidents in the areas covered by the uniformed members. 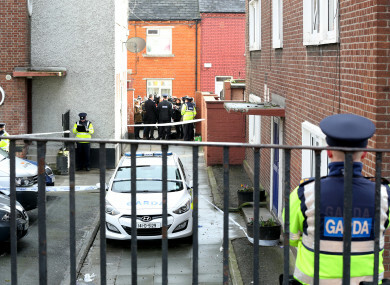 However, the gardaí posted outside the homes of the suspected targets fear that they will not be able to protect themselves in the event of a gun attack – as it may take some time for the armed members to respond. An Garda Síochána do not comment on security matters. While the Garda Representative Association (GRA) said it could also not comment on the specifics of the review, it said the safety of members was paramount. Everyday, our members walks towards danger so that the public may walk away. They often work in a hostile environment and everything needs to continue to be done as between ourselves and garda management, to put every protection in place to ensure all their safety. It also emerged on Thursday that a member of the Hutch family was the target of yet another gangland murder attempt. This man lives in the Wexford area and is a well-known target for the Kinahan cartel – having escaped a previous attempt on his life. Thursday’s arrest has shown gardaí that the Kinahan/Hutch feud, which has claimed the lives of 14 people in two years, is not a Dublin-only issue. The feud itself has, for the most part, remained in the greater Dublin region. “We stated on numerous occasions that our efforts at tackling organised crime, particularly where it gives rise to threat to life, is unrelenting. Those within the world of organised crime who display a total disregard for human life remain within our focus and we are determined to cause them to be arrested, charged and where the courts determine there is sufficient evidence, convicted and incarcerated within our prisons. Email “Unarmed gardaí posted outside the homes of gangland targets having safety reviewed”. Feedback on “Unarmed gardaí posted outside the homes of gangland targets having safety reviewed”.